What can you buy for ten bucks? WHAT CAN YOU BUY FOR TEN BUCKS? I GUESS IT DEPENDS ON WHO YOU ARE. My wife is Scottish. I know, I know, in fact we all know the stories about the Scots ability to hang onto a dollar. But my wife is not like that. Because she has expensive tastes I don’t mean to imply that she is a spendthrift. But she is what I call “high expense – low maintenance” and she always has an eye for “a wee bargain”. Now my friend Doug Crawley, I don’t know if he is also “high expense – low maintenance”, you would have to ask his wife Beth about that. But I do know he has an eye for “a wee bargain” and he seems to have some incredible luck when it comes to musical instruments. 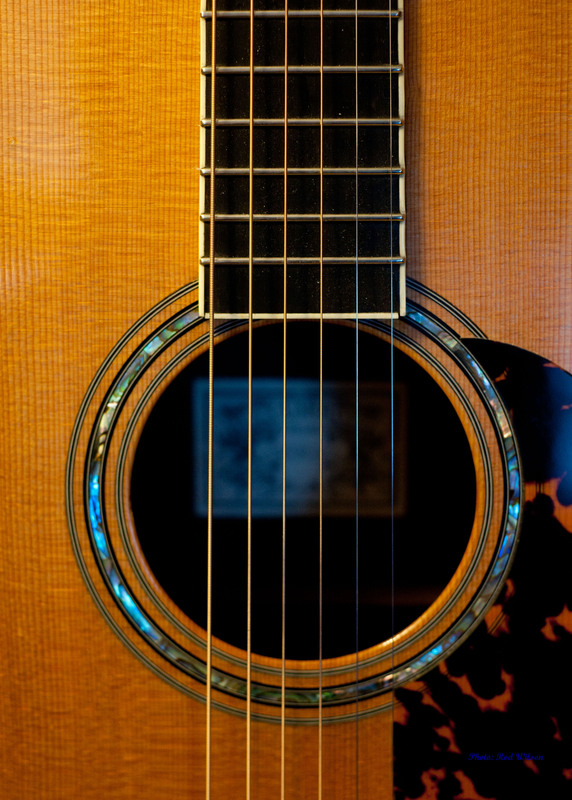 There is the story of the e-bay bidding war for a Larrivee guitar. Then there is that beautiful mandolin, fully re-furbished, that he picked up for an unbelievably low price. 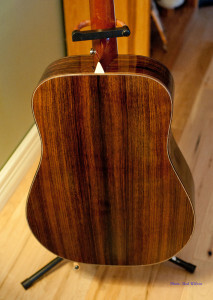 Last, but not least, there is also the tale of the $10 purchase of a D09 Larrivee Dreadnought. On a recent summer’s day he was on his way downtown to take in a concert in Rotary Park. It was a beautiful day so he had decided to walk rather than drive. On the way he passed one of those traditional yard sales. It didn’t particularly attract his attention until he spotted a guy walking out of the yard with a guitar. So just on the off chance he wandered into the yard just to check on what inventory maybe left. There it was. 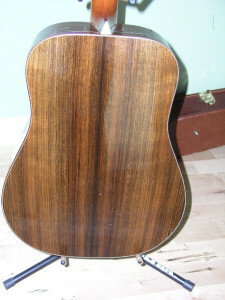 A Larrivee guitar that looked like it had been in a train wreck. It was broken, battered, and bruised with lots of major splits in the top and sides. It looked like it was beyond redemption. Also, on the off chance, he offered the owner $10 and, lo’ and behold he became the new owner of a piece of what he thought was un-redeemable junk. Doug and his wife Beth already owned a number of Larrivees and he thought that perhaps there might be something worth redeeming in the mess. 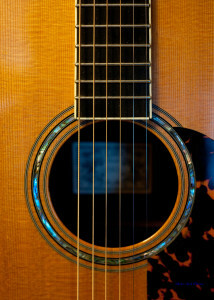 When he got back home he did an internet search on the serial number and discovered it was a D09 Dreadnought guitar, rosewood back and sides with a solid spruce top, probably built in Vancouver around 1994. The current list price of that same model today is over $3,000. What to do? It may have been worth that amount when it was new but in its present condition it was far cry from anything like that value. Or so he thought. He took it to the local Luthier Jamie Wiens to determine what were the possibilities. 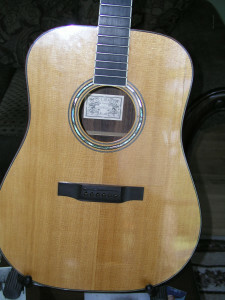 Given the make and model of the instrument Jamie felt that he could restore the instrument. It would not be one of his top priorities but he could fit it in with his bread and butter custom work. The project presented a substantial technical challenge that intrigued him. It was somewhat akin to putting humpty dumpty back together again. It would require a lot of custom improvisation to get the job done. Just getting the neck off the fractured instrument would require some ingenious tinkering that required building a device to generate steam and direct it to neck joint to loosen the glue. At the end of the day Jamie rehabilitated the instrument and here is the list of what was required…….. Glue neck, block and clamp. 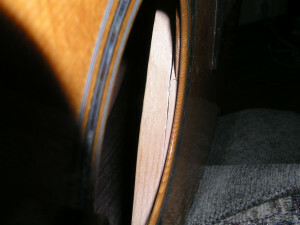 Align and glue the large crack in the treble side. 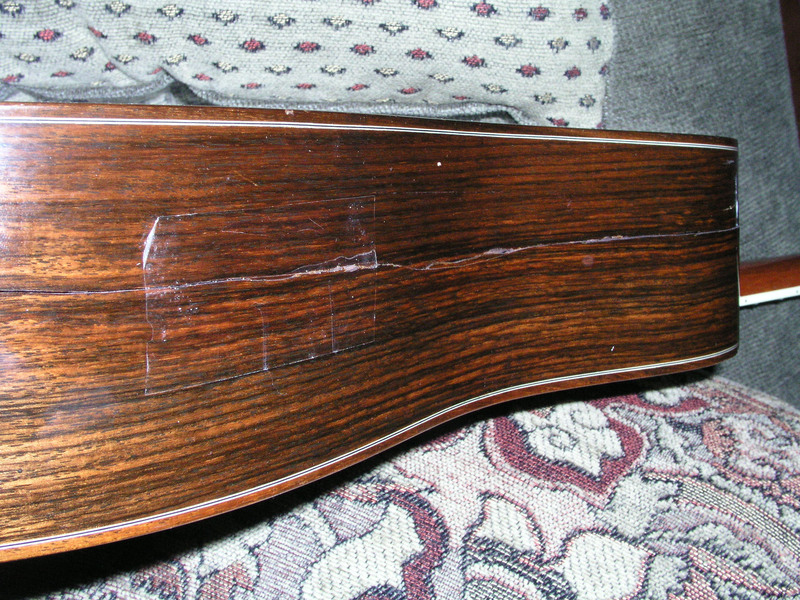 Align and glue the large crack in the bass side. Glue, clamp and splint the X brace. 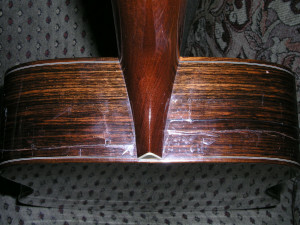 Glue and clamp the cracks in the top. 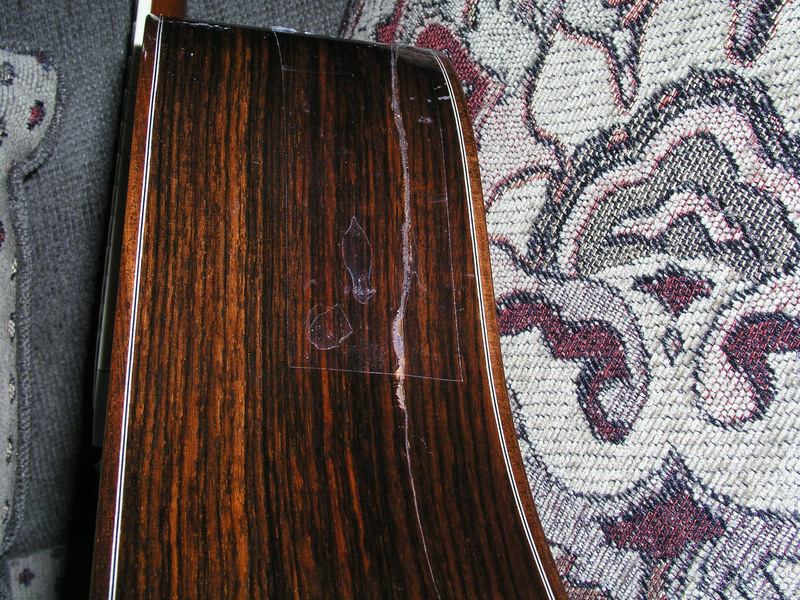 Two rosewood re-enforcement patches and glue to the bass side. Clean up the glue residue. Buff and clean the body. 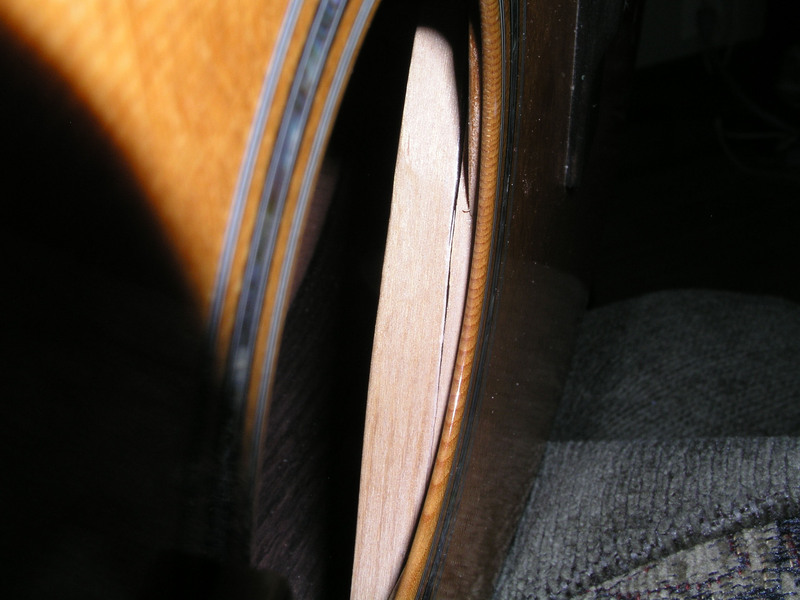 Fix the crack in the finger board. 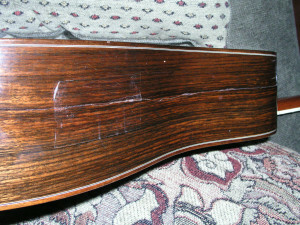 Scrape and clean the binding. 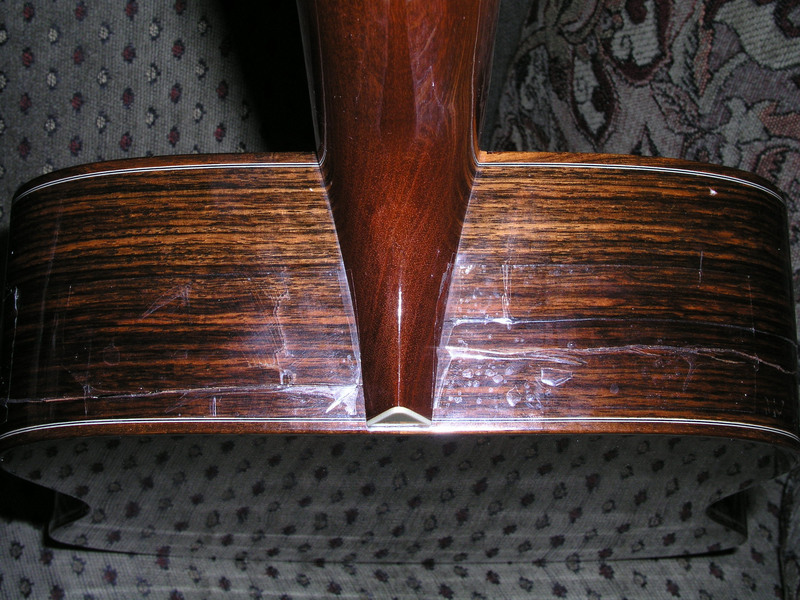 Level and dress the frets. 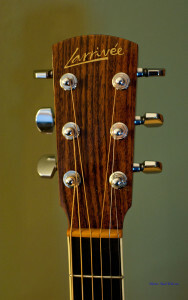 Supply and install a Taylor end-plug, pin, and strap pin. 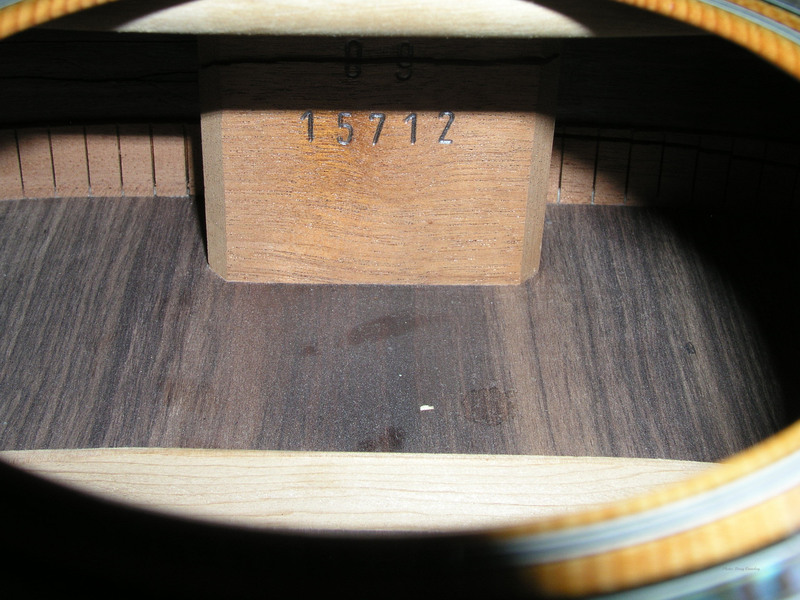 Install new light gauge strings. 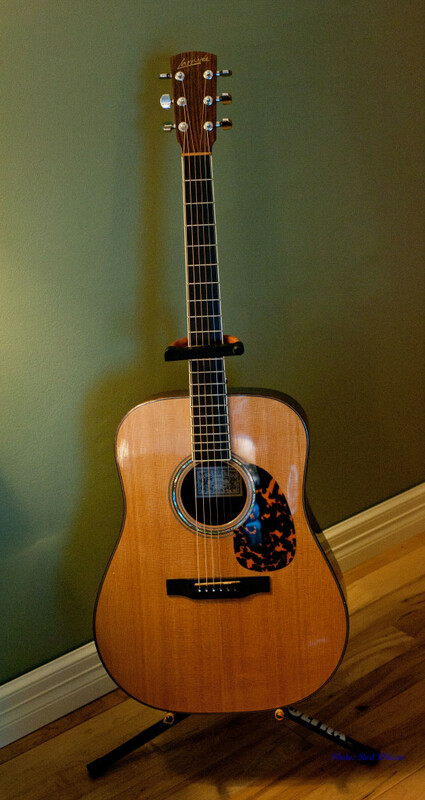 Install a new faux tortoise shell pick guard. Supply old ebony bridge pins. So here we have Humpty Dumpty back together again sounding beautiful, looking stunning and very comfortable to play. 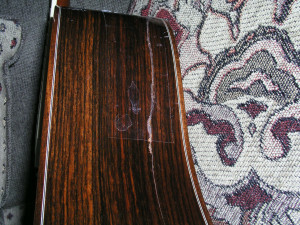 I defy anybody to be able to find the original cracks in the rosewood back and sides. 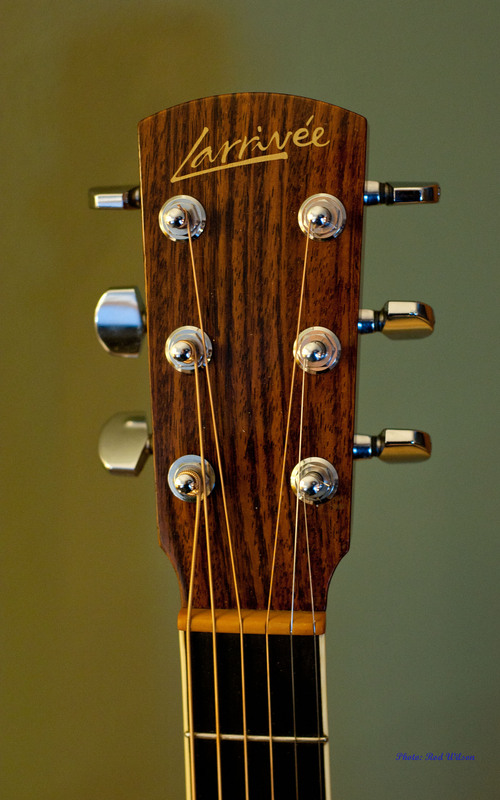 So this is what ten bucks (plus rehabilitation costs) can buy you in this day and age – a beautiful D09 Larrivee Dreadnought Guitar, as new, with a current value somewhere around $3,000. Only Doug Crawley could be that lucky.